I have spent a portion of my adult life learning and telling First People stories. Some of these stories are about Rabbit. Rabbit, like Coyote and Raven and Bison, are not about rabbits and ravens and such, but about the spirit powers that shape us and those creatures to this day. These stories are inspired mostly by Native American stories that I find in books, and other folktales. I tell the stories has having occurred when the world was “made but not yet finished”. This is a way of saying they did not happen in any literal, historical time, but also that they are happening right now. I tell the stories not as “Indian” stories or as “African” stories, though I do tell what my source was. But I tell the stories as Unitarian Universalist stories as a U. U. Minister. They are very important to my theology in that they are reminders that human animals and other animals are all related. They are reminders that the same forces that created us are involved in creating everything else. They remind us that no matter how smart we think we are, we still make mistakes and need to learn. I tell these stories to remind my people that the imagination is always running, always powerful, always a part of the religious and spiritual life. Furthermore most of the stories remind us to not take everything so terribly seriously, but to laugh in through our tension and dream through our trials. 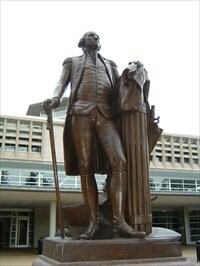 Rabbit was a very powerful figure in many parts of North America before it ever had that name. He was “tricksy” and clever, and a bit more powerful than Bugs Bunny, but not too different from him. My favorite story of Rabbit starts when he steals from Lynx, and then is chased through the woods. Each time, before he is caught he takes on a disguise, such as an old grandmother with two long braids, or a shaman with two stretched out earlobes, or a young warrior with two tall feathers in his hair. This sculpture is titled “Thinker on Rock” by Barry Flanagan. I then saw Rabbit dancing in downtown Saint Louis next to the Scottrade Center arena. 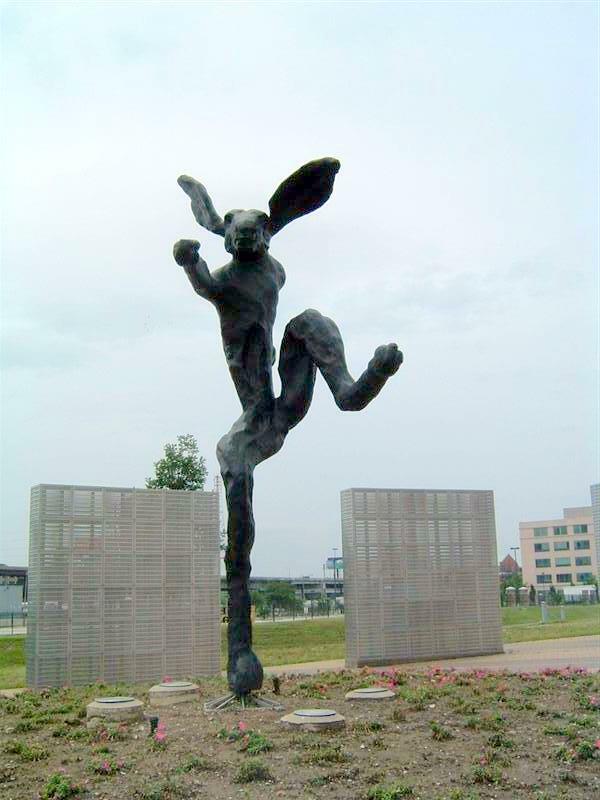 The sculpture there is called “Nijinski Hare,” also by Barry Flanagan. Only a few blocks from there Rabbit takes a very sedate and even cute pose as “Two Rabbits” by Tom Claassen in the City Garden. These “light” sculptures are made of bronze! A few steps away he is amorously entangled with a bird playing the saxophone. I could not find a good photo of this sculpture, “After Hours” also by Catharine Magle. So, there he is. Old Trickster Rabbit, even in a town named for a French King, causing smiles, eliciting thought, and reminding us that we are all related. At the front door, you smile at the next man who enters. He does not smile back. Instead, he greets you with a hateful stare and bullets from his gun. Sikhs from India began immigrating to the United States in the late 19th century, and currently the Sikh popuation numbers about 314,000 in America and 30 million worldwide. Today, Sikhs are successful business people, active community members, and advocates for social justice. In living out that hospitality, Sikhs remind us of our own quintessentially American generosity. A core American idea is that we welcome contributions from all different groups and build cooperation between people of diverse backgrounds. It’s the theme of my new book, Sacred Ground: Pluralism, Prejudice, and the Promise of America. As Sacred Ground discusses, there have been periods in American history when the staunch opponents of pluralism have won the battle. But they didn’t win the war, because irrepressible people of good faith refused to surrender their nation to such fear and hatred.